Wedged between the crumbling empire of Taldor and the devil-worshippers of Cheliax, the self-made nation of Andoran shines proudly on the coast of the Inner Sea. Ruled by a Supreme Elect chosen by the people, Andoran is surrounded by aristocratic enemies who believe the republic is an experiment doomed to failure, but who also fear its growing power. Within its own borders, Andoran must face the threat of the greedy Lumber Consortium, warbands of hobgobins, tribes of werwolves, and increasingly violent creatures of the wilds who are enraged at seeing their forests destroyed for profit. In-depth gazetteers of Andoran's settlements, from the seaport capital of Almas to the Lumber Consortium-controlled city of Oregent, and all the minor settlements clinging to existence on the dangerous wilderness frontiers. Details on the organization of the Eagle Knights, including the Golden Legion, Steel Falcons, Twilight Talons, and Gray Corsairs. Secrets of groups with no loyalty to the gevernment of Andoran, including the thuggish Lumber Consortium and the deposed nobles of the Seven Houses. Numerous adventure sites ripe for exploration, including the fey-ruled Candlestone Caverns and the ancient burial mounds of the Nogortha Necropolis, plus a detailed regional map that allows heroes to navigate the untamed lands between civilized settlements. New monsters, NPCs, random encounter tables, a full write-up of the nation's patron agathion and more. 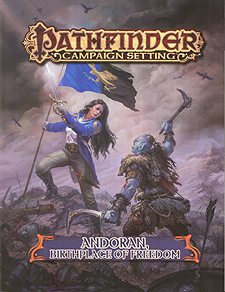 Pathfinder Campaign Setting: Andoran, Birthplace of Freedom is intended for use with the Pathfinder campaign setting, but can be easily adapted to any fantasy world.